Service animals play an important role for many students with all types of disabilities. Service animals offer their owners significant emotional and physical support, as well as an additional level of mobility and access to daily living activities. Nationally recognized for its commitment to students with disabilities, Wright State University was one of the first universities in the country to offer an on-campus dog park reserved for service animals. Service animals within the fenced park area are permitted to be off leash in the safe and secure environment, allowing both animals and their student owners to exercise, relax, and socialize. 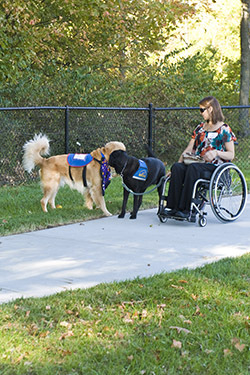 The park is strictly designated for use by service dogs and trainees only. Pets are not permitted under any circumstances. The service dog park is open 7 days a week, from sunrise to sunset. All service dogs must be licensed and wear current license and vaccine tags. All service dogs must be leashed when entering and exiting the fenced area. Gates should be closed at ALL times. Owners/handlers must be in voice control of their service dog at all times. Owners/handlers must pick up after their service dog and dispose of all litter. Owners/handlers are responsible for any injuries or damage caused by their service dog. No smoking, no alcoholic beverages, no glass containers, and no eating is permitted in the park. Agility/exercise apparatus is for service dogs only. Please do not sit, walk, or climb on the equipment. Owners/handlers who fail to comply with these rules will be asked to leave. Please contact the Office of Disability Services at 937.775.5680 with any questions or concerns. Dedicated in honor of former Wright State student Samantha Laux and her service dog, Dylan, the park exemplifies the university’s commitment to creating an inclusive and dynamic learning environment. Our first set of memorial bricks were installed in October 2018 as we celebrated 10 years of four-pawed fun! Support the park by dedicating a custom brick to your loyal service dog, emoational support animal, therapy animal, or pet. Click here to order your memorial brick!